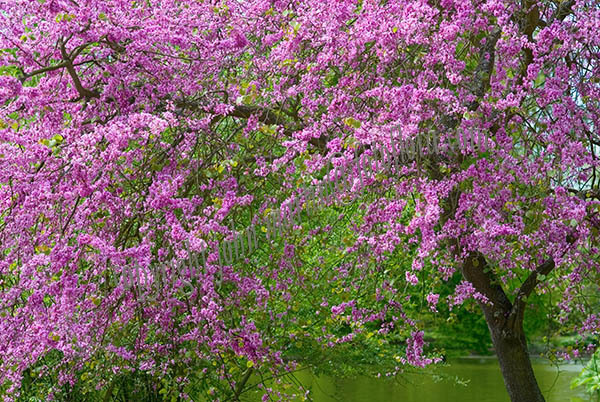 The Judas tree is a beautiful, spreading, multi-stemmed tree bearing clusters of bright pink - white pea-flowers that open before or with the leaves. They are followed by flattened, deep purple pods and in autumn the leaves turn to warm, golden shades. It prefers deep, well-drained soils and a position in full sun or partial shade. It has the added benefit of being able to fix nitrogen and is an excellent choice for the ecological garden. It is noted for attracting much wildlife, especially bees. native region: S. Europe to E. Asia. Is susceptible to Coral spot fungus in moist areas. Deciduous tree growing to 12 m (39ft) by 10 m (32ft) at a medium rate. It is in flower in May, and the seeds ripen in Sept. The flowers are hermaphrodite (have both male and female organs) and are pollinated by bees. The tree fixes nitrogen which can be utilized by other plants growing nearby.